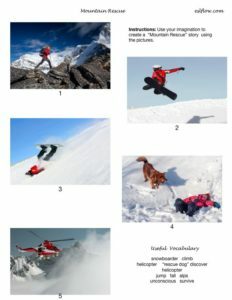 The pictures show the story of snowboarder who climbed a mountain but then had an unfortunate accident while snowboarding down. Click on the image or the link to download the printable PDF file. “Oil Spill” is the story of a damaged tanker leaking oil and bursting into flames. The leaking oil kills wildlife and contaminates the environment. 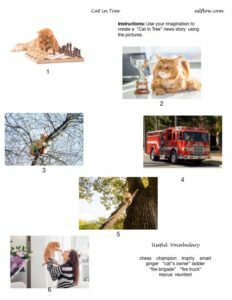 These pictures about a genius cat who gets stuck in a tree form the basis of a local human interest story. 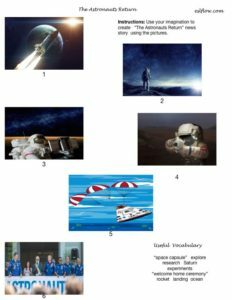 In this international news story writing exercise, students have to write a story about the the recent (fictional) discovery of a painting by Leonardo Da Vinci similar to the “Mona Lisa” but titled “Lisa’s Sister”. Another international-type news story that reports on a space exploration and research expedition. This is a sports story about an up and coming tennis champion. The story tracks the female tennis player’s career from her childhood and speculates about her future success. This is another human interest story. 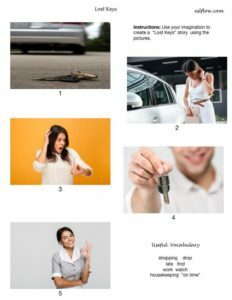 It is a story telling exercise about a common everyday occurrence. A woman loses her keys at the department store and is worried about being late for work. But everything ends well after her keys are returned to her.